he may not be active, all of the time. to dig that one out, is too much of a chore. I can hear him now, the QRM has gone. "That Sid you know, is a QRP fan." This rig works great and has good stability. Yep I'm certain now, the rig's doing fine. That he explains, makes the signals come through. This QRP man is doing just fine. he joins them all up, with his lead based glue! from his ultra small, QRP kit! just give him some room, don't pinch his spot! 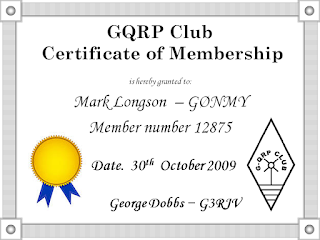 Well I came across my old G-QRP membership certificate, Sadly its got water damaged. So I decided to see if I could make a Duplicate. And once I found the Template the rest was easy. So I hope George Doesn't mind I will eventually print it out and put it in a Frame on the shack wall. 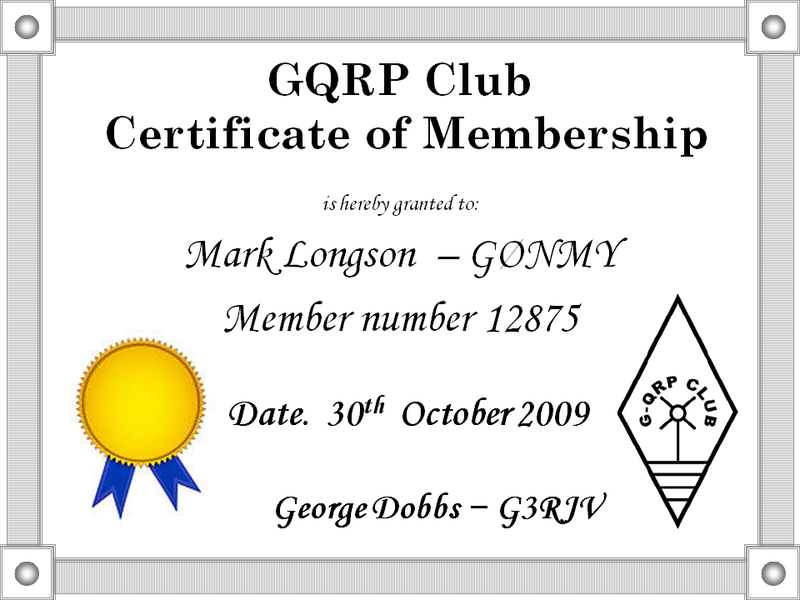 Check out the G-QRP club if you like to do more with less.